I knew nothing of Performance Art until I was about sixteen or seventeen, and when I first learned about it I probably had the "You call this art?" sort of attitude toward what is now generally considered to be a rather "conventional" and benign artistic practice. A proud introvert in my teens, I shunned all types of exhibitionism, be it artistic or otherwise, so even though I finally warmed to the idea of Performance Art and was even genuinely impressed by some of its pioneers, I was still quite certain that this kind of artistic expression was not for me. Like many of my art school peers, I was intellectually stirred by the conceptual performances of Joseph Beuys, though I can't say I understood any of it. I was shocked and excited, perhaps sadistically, when I learned that American artist Chris Burden had someone shoot him in the arm as a performance piece (Shoot, 1971). And for a period during my college years I was obsessed with Fluxus, the international movement that emphasized play and "happenings" in its art. Yet I never attempted to get involved in performance, preferring solitude as my audience. So when Nawa Kohei asked me to collaborate with him in a performance at the Museum of Contemporary Art Tokyo, on August 28th, as the closing event of his highly successful solo exhibition, my initial reaction was, "I'm no performance artist. What the hell am I going to do?" I was ready neither to shoot myself anywhere, as Burden shot his arm, nor put myself in a room with a live coyote, as Joseph Beuys did for his legendary I Like America and America Likes Me piece in 1974. Of course, apart from the anxiety, I also felt extremely honored and thrilled to be part of the event. However, the performing part of it was not the only concern. I soon learned that we would be doing "something" in a very large space, on or in front of a huge wall (about 15 meters long and 5 meters high), and for two hours! I think even a professional performance artist would have worried about that condition at least a little bit. In addition, that very large space was currently the section in Nawa-san's exhibition where the model parts of his very large proposed public sculpture, Manifold, were displayed; it was the "Manifold Room." Soon to be erected in front of a gigantic shopping complex in South Korea, Manifold is one of Nawa-san's more recent sculptural approaches, and one that's particularly ambitious, both physically and conceptually. The general, non-mathematical definition--though Nawa-san's use of it is probably intentionally interchangeable--of "manifold" is close to "diversity" and "multiplicity," and our performance was to function as another "fold," or an extension, of the sculpture. At first, Nawa-san and I thought about making a mural drawing together. To draw for two hours would be easy enough, but the question then became how to harmonize pace, space and design of the drawing. Free collaboration and concrete poetry are both always fun and liberating, but they're not, even when put together, "performances" in themselves. The spectators are a crucial element of any performance, and we had to consider what we wanted to present to them. 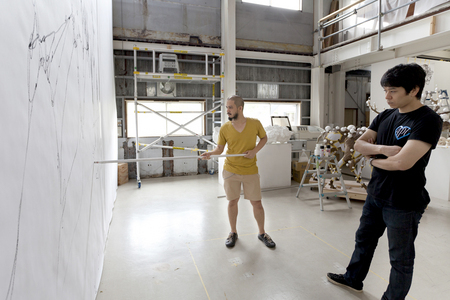 At Nawa-san's Sandwich studio we made several test drawings on a high partition built for this exact purpose: to mimic the white museum/gallery wall so that artists who use the studio can imagine what their works would look like in real exhibition space. Several Sandwich staffers helped to invent new drawing tools and some students assisted our preparations and rehearsals for the performance. We also tried various types of mediums to compare line qualities and their overall controllability. This part of the process usually comes with frustrations and disappointments, for no matter how experienced an artist one is, no matter how familiar with the mediums, every new work is always, to a certain extent, a new beginning, as every subject is a new challenge for the photographer. And new beginning is, as a rule, full of unexpected errors and unsatisfying results. After a few trials on the partition, we decided that I would, instead of collaborate on the drawing, recite poetry while Nawa-san worked on the mural. It made more sense for Nawa-san to "take center stage," so to speak, because, after all, this was going to be a kind of farewell to his exhibition. So, for days I worked on the words I was to recite for two hours in front of presumably at least a hundred, mostly Japanese museum visitors who were not at all familiar with my work. I was happy to be reciting poetry rather than drawing--drawing gives me tremendous pleasure but I feel that I tend to draw in a very typical Abstract Expressionist style--but the level of anxiety did not decrease. 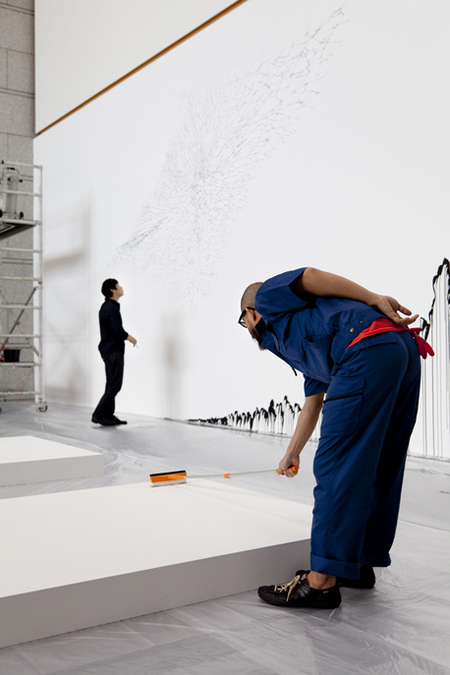 When the performing date neared I suddenly had a different idea for my part of the act: I would appear in front of the wall several minutes after Nawa-san, dressed in a janitor's uniform, use a mop to absorb the excess pigment dripped onto the floor from Nawa-san's drawing, and make horizontal paintings with it. 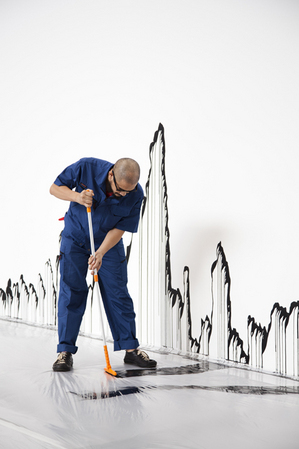 The idea was to take the role of an "art cleaner" but "make" rather than "erase." I thought the idea itself also related subtly to the conceptual aspect of "manifold." And it would add humor to the performance. I always like a touch of humor in art, or in anything for that matter. The performing day came and went (we were also very lucky to have Kawol, a wonderful musician, collaborate with us throughout the performance), and I thought the experience was satisfying, even though the act turned out to be nothing like the idea we had in the very beginning. Thinking back to all the time Nawa-san and I spent preparing and rehearsing, with all the disappointments we felt and the solutions we had to discard in the process, I was very glad we went through all of it. One learns a lot when one fails. As Samuel Beckett liked to say, if you've tried and failed, try again and fail better. Born in 1973, a Thai writer and publisher based in Bangkok. He has published numerous novels, short story collections, and essay collections. In addition, he has also translated modern English-language classic literature such as The Catcher in the Rye and A Clockwork Orange into Thai. In 2002, his short story collection, Kwam Na Ja Pen (English: Probability), won the SEA Write Award. Apart from working in Thailand, Prabda has regularly written for Japanese magazines and exhibited artworks in Japan. He has written 2 screenplays for films starring Tadanobu Asano and he is presently collaborating on various art projects with Japanese contemporary artist Kohei Nawa. His literary works have been translated into Japanese, of which the most recent is the novel Panda.